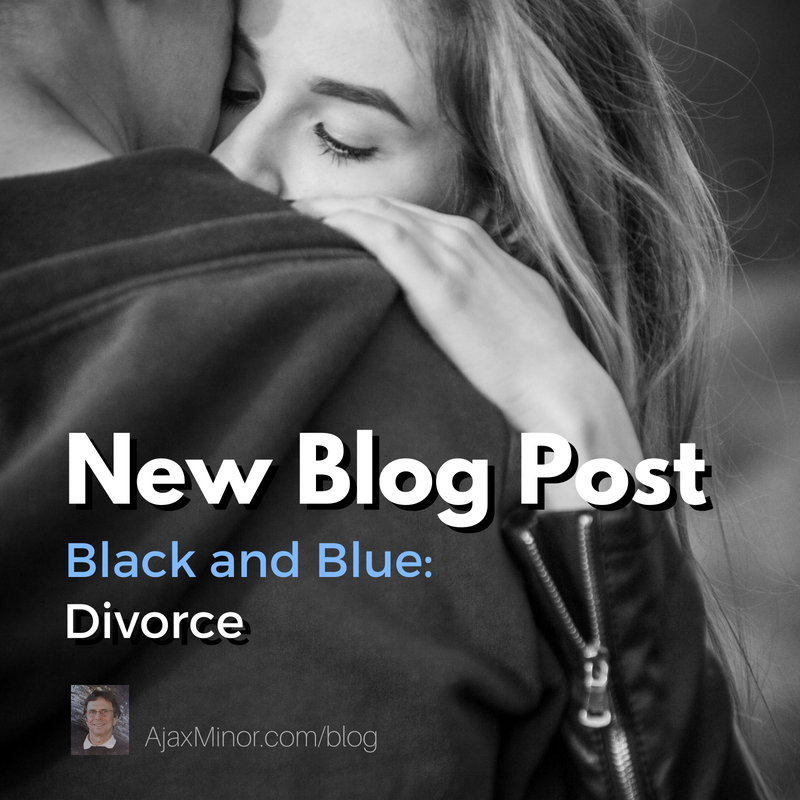 I wrote a Blog recently about The National Marriage: Red and Blue, a response to a David Brooks column in the New York Times. But what about the personal side of divorce? I went through one as a youth of 24. I had married a girl whom I’d first started dating in senior year of high school and then through college. She was, and is, beautiful and brilliant. A math major and a computer programmer way back when she’d often come home late because she had to wait for a program to run on time sharing. Anybody remember those days? Anyway, we’ve kept in touch over the years and now have semi-annual calls on our respective birthdays to catch up. She remarried to a wonderful guy. My dentist! Brilliant in his own field. She had two sons and now has grandchildren. So things have turned out pretty well for her without old Ajax. She said we were too young. And maybe we were. But the fault lies with me. However, that’s another story. Regardless, the pain and guilt remain. I write poetry from time to time to work on economy in my writing and to try different forms of expression. The poem is about a metaphorical gift of Anniversary Flowers—Click here to read. Is there ever such a thing as divorce without the feeling of guilt? Having been divorced twice, I think I am qualified to say that no matter the age, or the circumstances, there will always be guilt and pain. No failures come easy or are without consequences. Divorce affects more than just the couple. Sad but true, regardless of the facts, neither person is blameless. We are all flawed people. Being married at an early age had a lot to do with the marriage lasting seven years. (Although now that I have learned what a true marriage is, I am not sure I would call it a marriage.) In any case though, it was a union. The second one lasted for 23 years. Regardless of age, a true partnership can only survive when there is honesty and trust and you are both walking together mentally and spiritually in the same direction. It takes a total commitment to the other person knowing you are both flawed individuals dedicated to wanting what is best for each other. It takes a lot of patience, and time. Unlike a familiar movie line in “Love Story,” true love is willing to say I am sorry. In the world we live now, everything is disposable. People want instant satisfaction. Technology is replacing people to where young people don’t know how to communicate without texting.. There is more isolation and division between individuals and groups. My generation remembers a simpler time when families spent time together and enjoyed it. Relationships were precious. What I see in our midst now, are people who are unsatisfied, angry, self seeking, and wanting to change our countries values. Having lived through the sixties, I can say I am all for love and for peace. I am not for anarchy and disobedience. I see a movement or an uprising that tries to divide us and to create fear and mistrust. Just like in a marriage, it can only fail to bring unity and love.